Looking "where to sell my Pontiac Super Duty Trans am?" Ask the Chicago Car Club! Are you wondering "where to sell my Pontiac Super Duty Trans am ?" The Chicago Car Club is interested in classic cars of all makes and models, especially a Pontiac Super Duty Trans am. We make the process of selling your Pontiac Super Duty Trans am quick and painless. In just a matter of hours we will have your classic valued and, if you do so choose, turned into money in your pocket. All it takes is a phone call or electronic inquiry to get the ball rolling. Sometimes referred to as muscle cars, the Pontiac Trans Am was a sporty and fast performance car. So fast that it was able to reach a terminal speed of 103.56 mph in 13.751 seconds in 1973 at the Orange County International Raceway in Irvine, CA. When you look back at vehicles which were produced then and now there has been so many changes in the vehicles. The Pontiac Trans Am 1973-1974 was fast. When you look at the manufacturing process and the types of cars which were produced things haven’t changed all that much in terms of the mission but back then manufacturing was limited because of the financial aspect of producing this type of vehicle and innovation was expanded as a result of the failure of concepts. These cars were made with limited automation and great care was invested in getting it right. 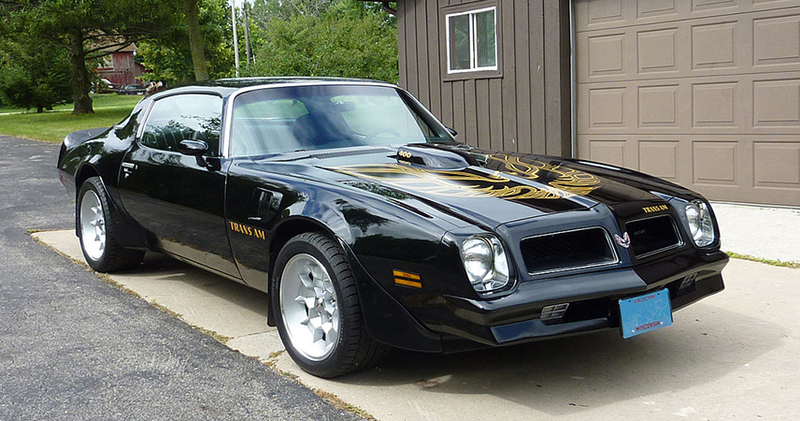 The Pontiac Trans Am was produced with a near race spec V-8 engine. It was called a super duty because of it’s near race perfect engine. Back in 1973, car manufacturers were retreating from having performance engines in cars which made this car all the more fast. It was also known for its large screaming chicken hood graphic which covered the hood of the vehicle. It had a reinforced block, special camshaft, aluminum pistons, oversize valves and header-like exhaust manifolds carrying a 310-horsepower rating. It was believed that this car actually had a 370 horsepower capability. There were only 252 Trans Am’s that got the Super Duty in 1973. The difference between the SD-455 and the standard Firebird 455 was the block which was reinforced with thicker bulkheads, 4 bolt main bearings and a more fortified camshaft and lifter area. This was important because it took into account the amount of vibration which occurred in the engine. The camshaft allows the valves in the engine to open and close which directly affect engine performance. The lifters reduces valve train friction and allow for power increase. Both of which affect performance. There were only 1,296 SD-455 produced in 1973-1974. The majority of which were produced with automatic transmissions. Only 72 of the SD 455’s had manual transmissions in 1973 and 212 out of 943 1974 SD-455 had manual transmissions. This vehicle was consider a muscle car and was sought after by car lovers. The SD-455 also possessed a unique, freer-flowing exhaust manifolds and dual exhaust. It stands to reason that this was because the engine was so large and so powerful it was necessary to have a dual exhaust and a free flowing exhaust manifold to manage the compression and engine speed. When it comes to gas mileage, it did not rate well. It had an average gas mileage of 12/17 mpg. Nonetheless this vehicle was head turning. One could not help but appreciate it’s performance, sleek styling and saddle interior. These cars can still be found for purchased on the market today. They usually have one or two owners and are being sold for over $60,000 today.